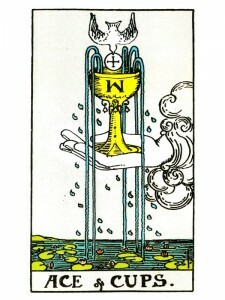 The Ace of Cups represents emotional and creative beginnings – the experience of joy, transcendent love and happiness. Your mind is filled with the spirit of love – you have the capacity to accurately express the internal feelings you experience. It is time for you to open your psychic, spiritual and unconscious channels. Be receptive to all the hopes and doubt that arise when you pursue any goal. FEEL your “inner” connection – your desire to nurture your goal along. Pay attention to the little details and you will be blessed with spiritual sensitivity and insight. Emotional fulfillment, perfection and blessings. Your “emotional” acceptance is required before any project can develop and flourish. LOVE gives your life meaning – it represents your clear, open, trusting, spiritual heart. This is the commencement of a love affair – developments that will effect your home and result in happiness. Emotional potential applying to relationships and creative projects. May be a proposal of love or of marriage – the offering of oneself to another. The offering of oneself to the world through one’s talents and energies. Ecstasy is yours if you have the courage to completely live out the full range of all your emotions – do not sensor or deny any feeling – they are all divine. Ecstasy is emotional intensity that comes from truly living and living is “feeling” – feel everything! Live life in all its passion and boredom, in all its pleasure and fear, in all its quiet satisfaction and raging anger, in all its ups and downs – be totally living and loving. Be emotionally honest – feel your deep spirituality and love completely. The successful completion of an emotional or creative matter to the highest of standards. God’s message delivered straight to the heart – God’s grace. Emotional, creative nourishment – cleansing, healing, happiness with relationships and self – expression. What messages are you receiving from your dreams and visions? In the first position: Initiation and achievement on the Emotional Plane – relationships and/or creative endeavors, will predominate. It falls to you to find original expression for your feelings and perhaps to assist others likewise, although a highly public life is not necessary with this card. However, what comes from you in this lifetime may eventually effect many. In the second position: Acceptance of the spirit of a guide or a strong aspect self from a past life, fully appropriate to this life path. Physical/material achievement based on emotional/creative resources. Brilliant originality in practical affairs along with proper motives. Nothing done at the expense of others, rather with full consideration of others and of nature. In the third position: This is a time of emotional blessings, gifts from others, cleansing, healing, invigoration. A new emotional beginning. A successful conclusion to an emotional issue or creative project of long standing. In the fourth position: The love of loving, of nurturing, of caring, of creating – all as facets of the desire to give of oneself. Infusion at an early age with spirit of universal love. Here one wants to be a “source”. In the fifth position: You are clear, fresh and confident – the possibility of a new start. Here are plans for a creative project, possibilities of a new relationship, as the mind dedicates itself to matters at the emotional level. The mind is in love, kindly disposed to self and others. Universal love permeates your immediate plans, your approach to things. In the sixth position: Emotional well – being. Sense of belonging, of being in the right place at the right time. Major relationships intact and rewarding. Creativity and energy levels at a peak. In the seventh position: Wide, clear opening of the Heart, the Solar Plexus and/or the Genital Chakras. Emotional balance and creative purity par excellence. In the eighth position: Emotional/creative abundance. Highly energized situation. Beginning of a new love or project or the carrying of it to a supreme level. In the ninth position: Wide, clear opening of the Heart, the Solar Plexus and/or the Genital Chakras. Emotional balance and creative purity par excellence. In the tenth position: Breath of fresh air. New emotions, new opportunities. A sense of being loved, of being able to love. This was my card of the day, it’s really quite encouraging.